Gun pictured is NOT included. Click here to order gun. It allows performance horses to compete at their best with a 15-day regimen. Use to schedule estrus and breeding to maximize breeding efficiency. Regu-Mate® is contraindicated for use in mares having a previous or current history of uterine inflammation. Pregnant women or women who suspect they are pregnant should not handle Regu-Mate®. More trainers are turning to Regu-Mate for horses to suppress estrus and make their mares’ performances more predictable. Regu-Mate effectively suppresses estrus in 95 percent of mares after 3 days of treatment. When treatment is discontinued, mares exhibiting regular estrous cycles return to estrus within 4 to 5 days following treatment and continue to cycle normally. Regu-Mate can help alleviate moodiness and temperament changes associated with estrus. It’s easy to administer – orally or top-dressed on grain. Contains altrenogest 2.2 mg/mL in an oily solution. Administer orally with dose syringe or by placing directly on feed. While wearing protective gloves, remove shipping cap and seal; replace with enclosed plastic dispensing cap. Remove cover from bottle dispensing tip and connect luer lock syringe (without needle). Detach syringe and administer solution orally at the rate of 1mL per 110 pounds body weight (0.044 mg/kg) once daily for 15 consecutive days. 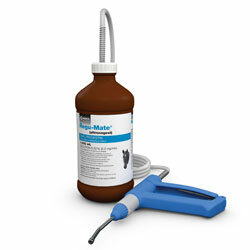 Administer solution directly on the base of the mare’s tongue or on the mare’s usual grain ration. Replace cover on bottle dispensing tip to prevent leakage. Excessive use of a syringe may cause the syringe to stick; therefore, replace syringe as necessary.